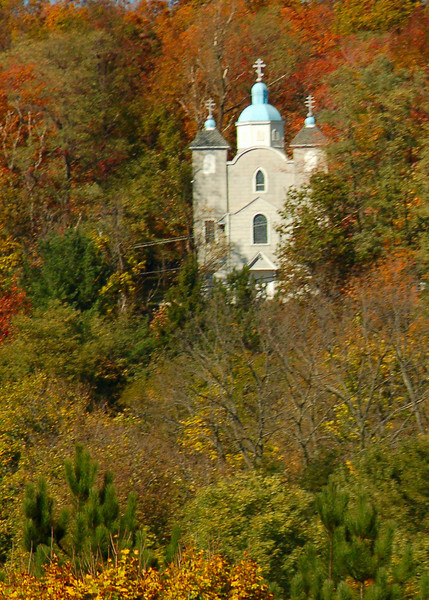 On my drive up to New York I noticed this church up on the hillside. On my way back home I decided to look for it. I found it above the intersection of two highways in central Pennsylvania. When I came back down the hill I noticed streets and sidewalks, but no other buildings for several blocks each direction from the highway intersection. Up on the opposite hill facing the church I spoke to several people who told me the story of how a fire started in the mine under the town in 1962 and has been burning since then. It is basically a ghost town now with only several buildings remaining including the church which was not affected by the fire. I decided to post the photograph although it isn't very sharp since the town faded away. Thanks for the many comments on my photographs from my trip. I have posted some others in a Fall Trip 2010 Folder and took some new photographs this weekend which I hope to start posting tomorrow.